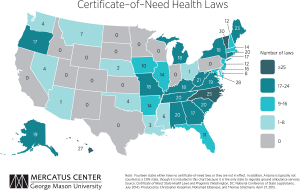 Currently, 36 states and the District of Columbia prohibit entry or expansion of healthcare facilities through “certificate-of-need” (CON) programs. These laws, which require government permission before a facility can expand, offer a new service, or purchase certain pieces of equipment, were enacted in the belief that restricting entry would lower health care costs and increase availability of these services to the poor. These regulations were initially enacted under the theory that unregulated market competition would drive medical providers to overinvest in facilities and equipment, raising the cost of medical care. – More than 130 fewer beds per 100,000 persons. – A reduction by between one and two hospitals providing MRI services per 500,000 persons. – A reduction of 37 percent in the number of hospitals offering CT scans. The first state to institute a CON program was New York in 1964, followed by Rhode Island, Maryland, California, and 20 other states over the next 10 years. In 1974, Congress passed the National Health Planning and Resources Development Act, requiring states to implement CON requirements in order to receive funding through certain federal programs. Louisiana was the only state not to implement a CON program during this time. In 1987, the federal government repealed the CON mandate, and throughout the 1980s, states began retiring their CON programs. By 1990, Arizona, California, Colorado, Idaho, Kansas, Minnesota, New Mexico, South Dakota, Texas, Utah, Wisconsin and Wyoming (a total of 12 states) repealed their CON programs. This left 38 states and the District of Columbia with these laws, although Wisconsin reinstated their program in 1993.